Still great quality and style as expected from hugo Boss. HUGO BOSS jumper. genuine BOSS jumper. logo on left arm. A very nice. light blue V neck . Men’s Hugo Boss Black V neck jumper Size L but shrunk in wash so fits size M Water repellant, regular fit Airing under armpits and at back of neck RRP £120 Only worn once before shrunk! My boyfriend is very upset to part ways with it! Lightweight Cardigan with piping on neck line and front, Hugo Boss logo embroidery on chest, Hugo Boss label to bottom front of cardigan. A great modern cardigan for any occasion. 100% Virgin Wool. ITEM CONDITION. Perfect For Your Designer Collection, 100% Authentic. Material Composition: Pure virgin wool. Condition: Superb, perfect and unmarked. Our promise. Colour: Royal blue. Has had minor repair near sleeve, there was a small hole and it's been professionally repaired. Good used condition, has had casual wear. Condition is Used. 100% wool. Size large. 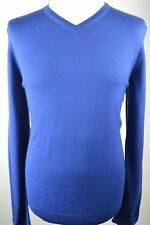 HUGO BOSS LARGE CREW NECK JUMPER EXTRA FINE MERINO WOOL USED IN GREAT CONDITION! HUGO BOSS jumper. Absolute bargain at this price! Worn twice only!! Spare button attached. Armpit to Armpit 27. Four button neck fastening. good used condition with only slight signs of wear. All nos in label to prove authenticity. 100% Virgin Wool Machine Washable. Sleeves Length underarm to cuff 19" 49 cm. Pit to Pit 20" 40" 102 cm. Length 25" 64 cm. PICTURE MAY LOOK SLIGHTLY DIFFERENT BECAUSE OF THE SUN LIGHTS AND OTHER SHADES. HUGO BOSS ORANGE JUMPER (GENUINE). STUNNING JUMPER FROM HUGO BOSS AT A FRACTION OF THE ORIGINAL PRICE. AUBERGINE PURPLE. 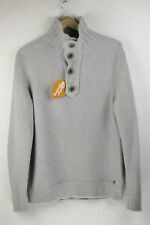 Hugo Boss Theyn grey 100% new wool V neck jumper in Large size with blue trim. Always ready to discuss and find a way for any unexpected issue. Hugo Boss Orange Crewneck Jumper. 100% Virgin Wool. Labelled as an XL but fits like a L.
ID NO : 50299947 RRP £85. Jumper is used but still in excellent condition. • Soft feel. Buy It Now = £50.00. Hoodies & Sweats. The fabric is 100% wool. Style: Jumper. Denim Waistcoats. Denim Jackets. Material: 100% Wool. Size Guides. Size Guide. Perfect For Your Designer Collection, 100% Authentic. ITEM CONDITION. £250 HUGO BOSS MAN taupe brown Beige slim fit merino wool roll neck jumper L40"
Layer this understated sweater under a sports jacket or team it with jeans for a laid-back look. HUGO BOSS ROLL / TAILORED TURTLE NECK JUMPER. DO NOT TUMBLE DRY. Woolprogram/Reshape after washing. Material information: 100% Virgin wool. Mens orange label HUGO BOSS Navy and signature small orange accent trim zip thru cardigan. Condition is Used. Dispatched with Royal Mail 1st Class. HUGO B OSS. Colour - Grey / Black. Double Breasted Fastening. Double Breasted Style. Two button fastening Gatsby Style. HUGO BOSS V Neck Wool Jumper. LIGHT JUMPER. width from armpit to armpit: 51 cm (20,1"), total length: 65,5 cm (25,8"). COLOR IS TYPICAL PURPLE! A - 51 cm (20,1"). B - 65,5 cm (25,8"). C - 52 cm (20,5"). D - 67 cm (26,4"). Condition : very good. Mens HUGO BOSS "Black" label wool 1/4 zip Jumper/Sweater size medium. RRP£165. Immaculate condition RRP £165. A classic elegant chocolate brown 1/4 zip jumper with a very soft feel and the iconic signature HUGO BOSS "Black" label tab logo to side seam. A chic stylish top quality 1/4 zip sweater/jumper from HUGO BOSS just exuding luxury. HUGO BOSS JUMPER. Material: 100% WOOL. We use grading scale from7 (excellent/as new) to1 (poor). Condition in out of 7 scale:6. always ready to discuss and find a way of any unexpected issues. Boys' Clothing (2-16 Years) Girls' Clothing (2-16 Years) Sporting Goods Skiing & Snowboarding Sailing Climbing/ Mountaineering. Helpful Links. Hundreds of carefully selected products added daily. Therefore, if an item did not fit, you changed your mind.